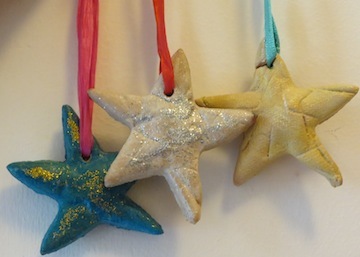 Salt dough is a great material to make homemade Christmas decorations from so why not try using our salt dough recipe to make these stars for the Christmas tree? Click here for instructions for how to make salt dough, and then come back here for ideas for Christmas shapes to make. Tie them up with colourful ribbons to hang off the tree or around the house! 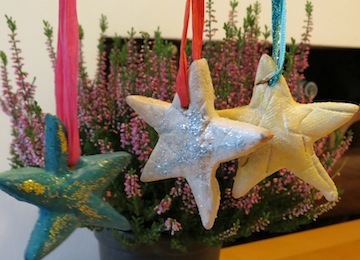 These are extremely easy and attractive decorations to make around Christmas and they smell really lovely. 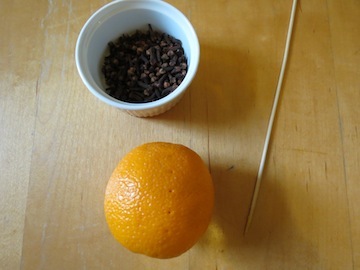 In order to make it easier to press the cloves into the orange we used a skewer (you could use wooden cocktail sticks). 1. 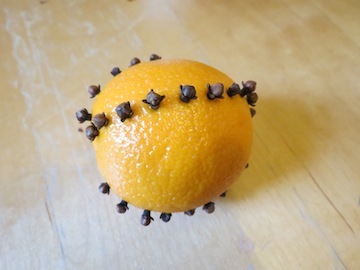 Use the skewer to make small holes into the orange where you want the cloves to go. 3. 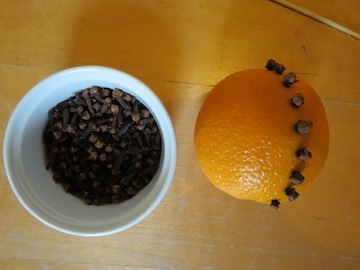 Put as many or as few cloves in lines up and down the orange as you like. We made the traditional four segments here, but you could experiement with two or three lines of cloves. Just remember the ribbon needs somewhere to go. 4. 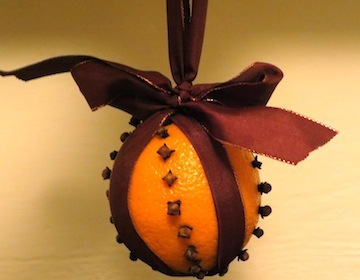 Tie the ribbon onto the orange as if it was a present - you might need to help your kids here. Start at the top and then cross and twist your ribbon over at the bottom to bring it back up to the top again. Tie a knot, or if you wanted, a bow. Click here for more ideas for homemade Christmas decorations including instructions for how to make a hanging dove and how to make christmas lanterns.